These are our top 20 shortlisted poster entries (in no particular order). The winner will be announced at Hemma Bar, Edinburgh (7-9 pm) Friday 5 September. Winner wins £1000 and we will print 10,000 of their poster. Congratulations to Fraser Croall, Ciaran Murphy, Rosie Balyuzi, G Connelly, Dhivya Kate Chetty, Fergus Walker, Andrew Mac, Gabriel Durnham, Jamie Rose, Lillias Kinsman-Blake, Helena Torry, R Campbell, Doug Summers, Simon Chadwick, Martin Laird, Maxwell McKilligan, Stewart Bremner and Ritchie Feenie. Doug Summers is fab – whichever way you look at it you know it makes sense! V clever! It’s Andrew Mac’s butterflies for me. It’s Winnie Ewings “stop the world, Scotland wants to get on” captured in art. It’s the butterflies for me too! Exactly Patrick – I just love the butterfly one. It is a work of art rather than just a poster. Standard is more than impressive. The Ciaran Murphy is striking and very likeable and might be my favorite but the butterfly’s, the Jamie Rose one, the Fergus Mac and the last one gets the message across and is very elegant. That is just personal preference as I can’t see a weak design among them. They’re all great but the butterfly is fantastic particularly because it says so much but without needing to use words and as seen as you see words people start to find counterarguments to them. I adore this, as it really makes a simple but profound statement of intention. Damn right, and let’s do it! There are some really good posters there, and it’s a shame some other good designs had to miss the cut. My favourite is possibly the one comparing France in 1789 with Scotland in 2014. You folks in Scotland can achieve some significant social and political progress, but without the bloodshed. Let’s hope other nations head the same way. I’m not sure how the people of Shetland will feel about Ritchie Feenie’s poster omitting their islands. I love Andrew Mac’s butterflies. It is arresting and beautiful and gets its message across perfectly without any text. Dhivya Kate Chetty actually -ma wean !I think they are all gorgeous and the judges will struggle! So many excellent posters. Great work everyone. My top picks are based on the ones that gave me goosebumps upon reading them, really powerful messages. In no particular order… Andrew Mac, Dhivya Kate Cherry, Ritchie Feenie and Ciaran Murphy. Andrew Mac butterflies. You have to pause and engage with the message. So much talent!! Great entries. (Wish they had come out earlier.) I once a had great book of Cuban posters edited by Susan Sonstan and it would be good to see a book with all of these! Engagement with a poster is not quite enough : it should have in it “a call to action “-to DO something ! Ciaran Murphy ticks all boxes, tradition and modernity, the call and bold assertive image GREAT!! Andrew Mac runner up for a beautiful visual poem but with just weeks to go poems may not be enough! Helena, I love your poster linking the suffragettes to the indyref. As you will know, so many of the suffragettes were socialists and so many of the Scottish ones also home rulers. I like the butterfly one, but Arlene is terrified of butterflies. The wrapping paper one is my favourite one though, whichever way you look at it. The one I liked from the long list isn’t there! So different! It depends on the context, too. I love the butterflies, on my computer or on my phone, but when I printed it out in A3 and put it in my window, it didn’t seem to have the same impact. I think you need to contemplate it. Really, whichever one wins, nobody will be able to complain because they’re all so good. To appeal to undecideds – Rosie (just so direct and in your face), Maxwell (concentrates the mind) and Helena (parallels with the suffragettes, who now would advocate a No to that). But there isn’t a dud among them. Yes I think that’s a good point – these are to have an impact. That makes a difference in thinking about it. Depends on scale and context. The butterflies are perfect within “touching distance” of the poster. In a window one would have to work the composition to enlarge and simplify the elements of the message to be understood from a greater distance. I could see the poster campaign in phases, first a print run in paper media that the observer can stand in front of or read, the second just a large butterfly in windows etc. Magic, powerful, wordless, truthful. pssst … there’s only 18 … just saying like. 2) Andrew Mac with some more butterflies! So wonderful! I’m very taken with the liber tae one, that’s clever and beautiful too, linking to the original declaration of human rights. I love the butterflies and could see Ritchie Feenie’s one as a t-shirt I’d wear pretty frequently over the next three weeks! Any tips on how I could get one of those? It has to be Andrew Mac’s butterflies. I felt a lump in my throat and a tear in my eye as soon as I saw it. So simple and so beautiful, it gets the point across perfectly. I felt that too, but a lot of the people I have shown it to have had to have it explained to them. 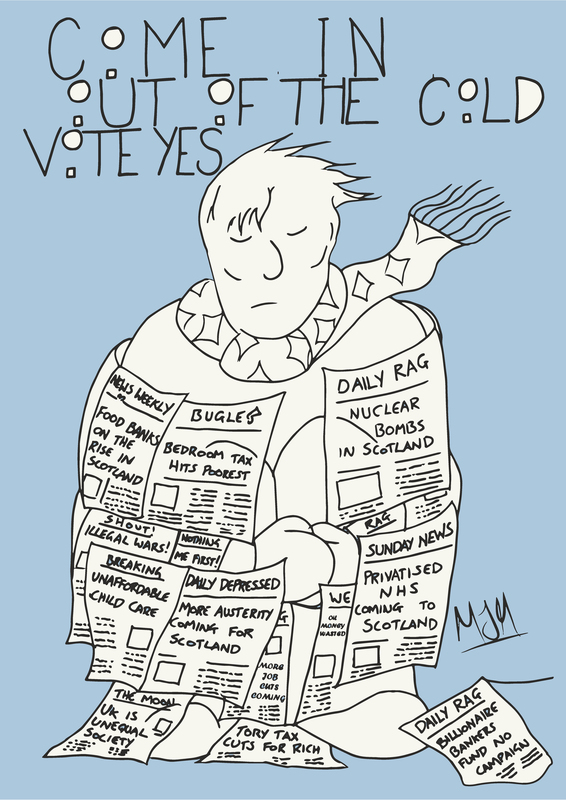 Yessers love it to bits but the undecided and unengaged often don’t seem to get it. Even to the point of not realising that the butterflies are countries bearing their own flags as their wing pattern. I totally love it to bits, but if we’re talking billboards then I wonder whether one of the others might have more immediate impact. Its the invitation to stop and think about its meaning and implications that is part of its irresistible hook, and that makes it ultimately so effective. Also, these little touches of colour on a mostly white billboard would be a killer. Good point. On billboards it would have to be a “slow burner”, something that slowly grew on folk and eventually got under their skin. Maybe there’s just still time for that. For a quick impact near the day, maybe the Create your Future one has a good punch. All excellent! Glad I don’t have to pick the winner. Don’t pick just one to use – the best of these – maybe top 5 – need to be seen, and the variety would give the right messages in different ways! Surely a truer reflection of the different groups all pulling together for YES. The Women for Independence one is great. Same Scotland – Different Approach = perfect! makes you stop, makes you think, says it all. Loads of great designs, but Andrew Mac’s butterflies get my vote. It is head & shoulders above the rest. Why posters – why not have them all printed as collectible beer mats/coasters? I love them all. But the butterflies are beautiful! So much talent! I love both Ciaran Murphy ones, probably the woman with red hair one most as it’s uplifting, also Fergus Walker, that’s a beautiful design, subtle, eye catching – all about sea, water and connectedness, very Scottish! It would be good to have these available as a series, it would be a good fund raiser too, though you’ve no doubt got plans re that already! The Unicorn for me. Says it all. Andrew Mac’s butterflies. Purely visual, takes a moment to sink in. The sort of thing you can see again and again without it getting old. Several others also excellent. The ayepad made me smile. Andrew Mac’s butterflies, hands down. Captures so much of the possibilities of independence in such simplicity. Fergus Walker’s caught my eye and imagination. He shows the spread and interconnections of Scotland & asks the question while graphically displaying the answer – links and communication bringing us all together. I love them all so it’s hard to choose. It would depend on what context you wanted to display them in. 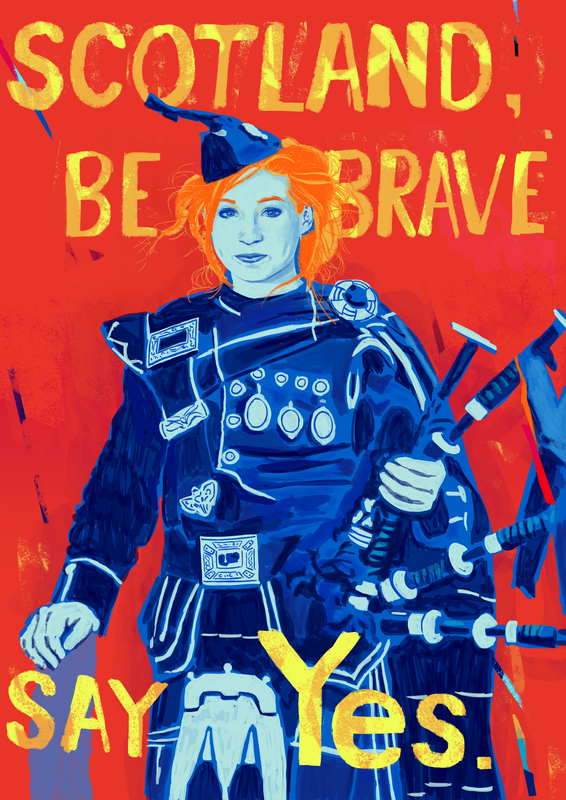 In the context of the vote I think Scotland Be Brave is the most compelling. It speaks to me because it exhorts us to courage but in a gentle way. It brings out the female, the inner soul. It is the anima not the animus. I also like the unicorn and the butterflies. It’s the butterflies for me. who would have believed that a butterfly could stir the soul of a nation and release its captive longings. They’re all great, but the butterflies are my favourite. I’ve had a print out of the butterflies up on the wall for about a month now. It never get’s old. I like the ayepad, relates to all the young uns, but they are all amazing. Particularly grabbed by women for independence, are you out for independence and the unicorn but love all of these. Take a bow, talented people. Hi Sarah the grass roots is free share you just do it at asda or a digital print shop cup posters and key rings printer or u could do a canvass for any other info contact bella Caledonia website good luck to u drop by anytime and a hope Scotland delivers a big yes for u ! Impossible to choose only one.Someone suggested having 5 which is a great idea. My own favourite is the Ciaran Murphy “Scotland be brave”. Like the message and the image. No particular order, but Andrew Mac, Helena Torry, R. Campbell. stand out for me. So many great entries and ideas though. These are fantastic, but Andrew Mac’s is so simple, powerful and emotional. The ” best way to predict future is to create it” cannot go out like that. You cannot simply cut off Shetland and expect that to be an acceptable image of Scotland. That just plays into Tavish Scott/Carmichaels hands to imply that Scotland ignores the Islands. Either withdraw it or get it amended to include the isles. It must not go out in its present form, and frankly I’m surprised you allowed it in as it is at the moment. Apart from that, some good images, although of the Unicorns listed in the long list list cant agree that you went for the best one. Really like the “wired” one. Andrew Mac’s. By a good margin. Scotland is catching up… and it is beautiful. Well done to each and every artist. I like them all. Yes I saw the butterflies on WoS ages ago and I thought then, this is it. So subtle, so discreet, makes you think. Ultimately, the sentiment will make many decide. This one is right to the point. Love the Women for Independence poster – the women I’ve met whilst campaigning this year have been so inspirational and this poster is beautiful. Also love Dhivya Chetty’s poster and it was fantastic to have her work in our Aye Inspired indyref exhibition this summer. She was one of the most popular artists. And as a fan of typography, Ritchie Feenie’s poster appeals to me, I’d have that on my wall too. Loads of great work – well done to all – all winners! I love the Women for Independence poster – the women I have met whilst campaigning this year have been so inspirational, and this poster is beautiful. I’m a huge fan of Dhivya Chetty’s work and it was fantastic to have her artwork in our Aye Inspired indyref exhibition this summer. As a fan of typography, I love Ritchie Feenie’s poster, I’d have that on my wall too! Well done to everyone, they’re all brilliant, and all winners. Andrew Mac’s butterflies. Simply beautiful; absolutely says it all. The Butterflies poster is wonderful and I hope there will soon be an opportunity for us to get good quality prints, but as other above have mentioned it lacks impact and we’re short of time. It appeals to converts, but a poster needs to reach beyond that. So I’d pick Jamie Rose’s simple and vivid ‘Yes’. The butterflies are amazingly beautiful and so simple. Alternatively, I like the ayepad for being clever and shiny. I’ve skipped reading the comments to ensure they don’t influence me. I guess I’m old fashioned (certainly oldish at a young 70) and rather conservative and old fashioned in my taste but I though four of the posters stood out. I particularly liked Dhivya’s message and in one respect it was top of my list but the French Revolution’s association with violence put me of somewhat despite its stirring message, Fergus’ live wire (communication) Scotland was deemed up to date and just as good but I felt the message wasn’t catchy enough, Jamie’s Raphealite woman is great (just like one of my daughters’). That left Ritchie’s Predict your future is to create it. Simple, straightforward, eye catching and true to the ideals that motivate many Yes supporters. I’d go for it. However, it isn’t me the poster is intended to influence. Although this is a competition, it’s a competition to produce a poster to influence voters. I would therefore pre test the most popular on a sample of voters in the most relevant social group. So hard to choose. In no particular order I like: Ciaran Murphy’s Yes to Scotland for it’s imagery – it sums up icons of Scotland for me, Helena Torry’s Women for Indy is just such a powerful message with a great historical x-reference, Andrew Mac’s butterflies is beautiful but I don’t do the flag waving thing comfortably, Fergus Walker’s interconnected lights is a stunning image let down by the text, and Rosie Balyuzi’s Big Yes Scotland is just so fecking cheerful and motivating. Inspiring stuff. Morva Wortley For me it has to be the Ayepad poster. When my grandchildren ask me what I did in the great social revolution of 2014? – I will be able to reply “well kids it was a 21st century revolution so we didn’t use bullets and bombs – I fought for it on twitter with my iPad”……. Loved Ciaran Murphys design G Connelly Ayepad also deserves a special mention for sure. For the purpose of the referendum the Ayepad should win it. as always its a real pity there have to be losers,in terms of the competition,here as I think they are all excellent.Still.the Butterflies do it for me.Simple and uplifting. I’d love to have every last one of these. They’re all so incredible and inspiring. Are the printable PDFs available? Or will any of these except the winner ever be sold?